Scottish Government called upon to review its position and act now to protect wild fish. 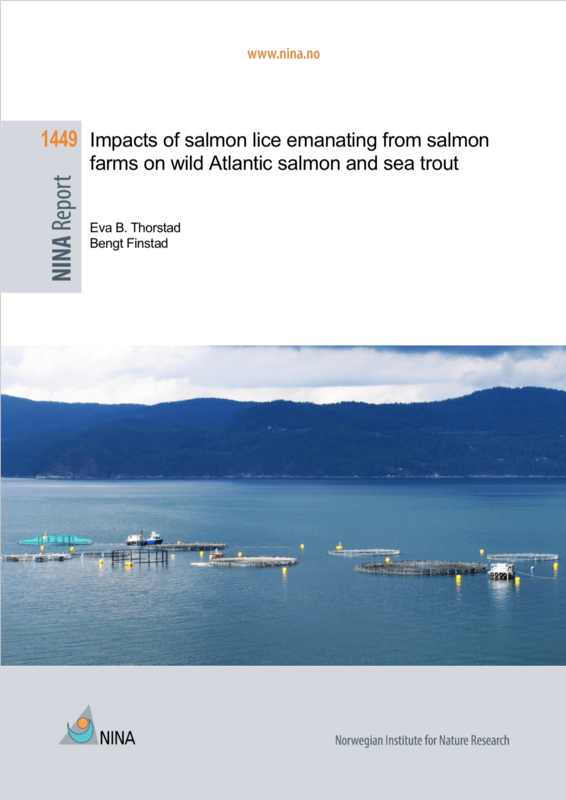 The report, Impacts of salmon lice emanating from salmon farms on wild Atlantic salmon and sea trout, is published by the Norwegian Institute for Nature Research (NINA), Norway’s leading institution for applied ecological research. It is authored by Prof Eva B. Thorstad and Dr Bengt Finstad, both internationally acknowledged for their expertise in sea lice biology and the interactions between salmon farming and wild fish. “For many years we have maintained that the Scottish Government’s position – that there is ‘no evidence’ in Scotland that sea lice from salmon farming damage wild salmon and sea trout ‘populations’ – is untenable. The Impacts of salmon lice emanating from salmon farms on wild Atlantic salmon and sea trout report substantiates our view that it would be very odd indeed if the Scottish situation was markedly different to elsewhere. Photo: Steinar Kålås. 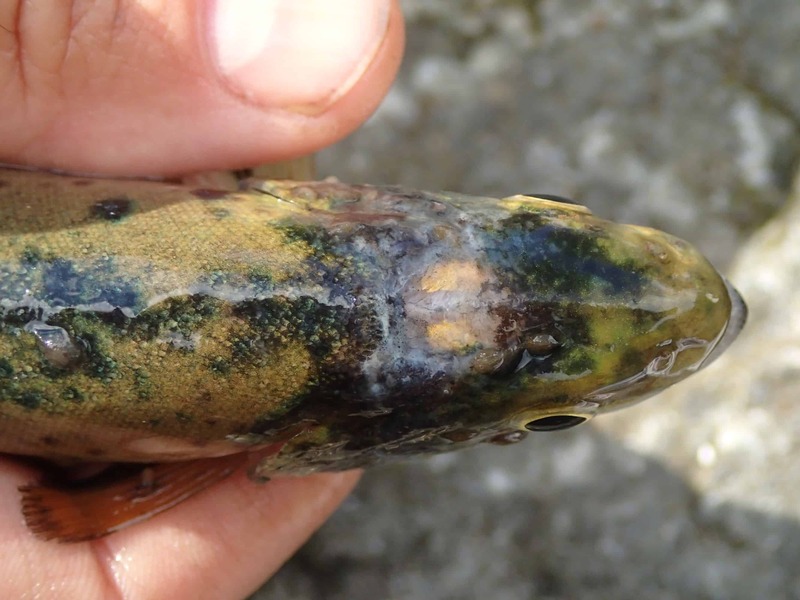 Heavily lice-infested sea trout, causing loss of skin and thus brain to be exposed. “At NASCO’s annual meetings Scotland has been repeatedly challenged for its systematic denial of any significant negative impacts caused by salmon farming in the west Highlands and Islands on wild salmon and sea trout. In June, the Scottish Parliament’s Rural Economy and Connectivity Committee, in response to a formal Petition lodged in the Scottish Parliament in February 2016 by S&TC Scotland seeking protection for wild salmonids from sea lice from Scottish salmon farms, agreed to launch an Inquiry (scheduled this year) into salmon farming in Scotland and the issues we have raised. Well done on the great work you are doing. Shared to No Salmon Farms at Sea facebook page. Surely a investigation is called for into the governments cosy arrangement with the supposed fish farmers (harmers) it really is a major crime just what they are getting away with. get out of the sea shores and up on the land ! The Scottish government has had a number of papers on the same topic since the late 1990’s, by the same authors detailing the problem in Norway. The other problem denied by Government is the epidemic of biotoxin production caused by the effluent from fish cages and evident in contaminated shellfish and other organisms receiving the polluted waters. If salmon farms are moved to the land, where will all the effluent go? Into the water table or directly into the rivers? Whilst I am very sympathetic won’t it just create another problem? For Scotland’s unique and precious environment it must properly engage with this problem despite the huge commercial pressures. Closed system salmon farming is being researched, and is not far away. It is in Scotlands and the Scottish goverments interest to close down the polluting farms and encourage investment in closed systems before closed system farms are established in places near the customers. ie China, mid east. Salmon farming in the Yemen ??? The government should also invest in restoreing the wild population, to bring back angling tourism. I agree with Patrick Quinn there is something nasty and hidden between the government and the industry which needs the light of day. Let us know the truth and change for the better. I think you will find that the vast majority of marine salmon farms in Scottish waters were consented by the Crown Estate and the Department of Transport in London between the early 1970’s and the late 80’s and had nothing to do with the Scottish Government. The cosy relationship was between the likes of Unilever, Booker, Norsk Hydro and the Crown Estate. For the Human race, Sewerage Treatment works are extremely successful. It doesn’t take a great stretch of the Imagination to see that the same would be true for Piscine effluent. Stop obfuscating and get on with it! It’s time somebody looked at prosecuting the Scottish government or minister/s responsible for the problem being covered up.There MUST be strong evidence that after all the reports from top scientists some ministers and government bodies CHOSE to ignore the facts and protect the fish farming industry because of the revenue and jobs it produced. Two minimum wage jobs for foreign workers who spend much of their income in their home country and are transient workers against the loss of a local job for life ? These companies are mostly foreign too, they wouldn’t get away with the destruction at home.We are destroying jobs in a way of life for low paid jobs and quick bucks – profits of which go abroad. If cuddly seals or dolphins were dying there would a national outcry….